Candlesticks are graphical depictions of price movement. Instead of giving us only the closing price per time frame (i.e. the daily close when referring to daily prices), they provide us with four prices: open, close, high low. Open and close form the body of the candlestick and high/low form the tails. 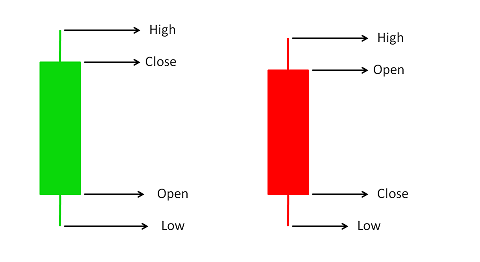 Red body means that price close below where it opened and green body means price close above where it opened. Consequently the colors depend solely on the price movement in a certain time frame (i.e. today) and they are not relative to previous time frames (i.e. the previous day). Instead of four prices candlesticks are providing clues as to who won, buyers or sellers and if it was an easy or a difficult victory. Alone or in combinations of 2 to 5 are providing clues for future price movement. 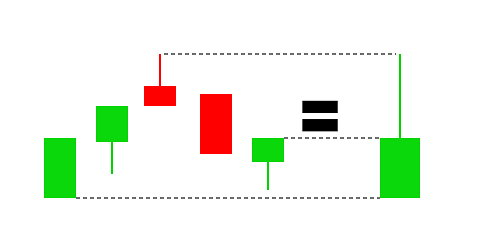 As every technical indicator, candlesticks must be used in combination with other technical or fundamental criteria before someone makes a trading decision. Candlesticks can be formed in every time frame (i.e. 5 minutes, 15 minutes, 1 hour, daily, weekly, etc). When we say a chart is 5 minutes, we mean the candlesticks’ time frame is 5 minutes and it provides information for the open, close, high, low in five minutes fragments. Candlesticks can be added up to form a new candlestick (i.e. one 30 minutes candlestick can be formed by six 5 minutes candlesticks, or one 5 minutes candle can be formed by five 1 minute candles). i.e. by taking the open, close, high, low of 5 consecutive 1 minute candlesticks we can form a 5 minutes candlestick.